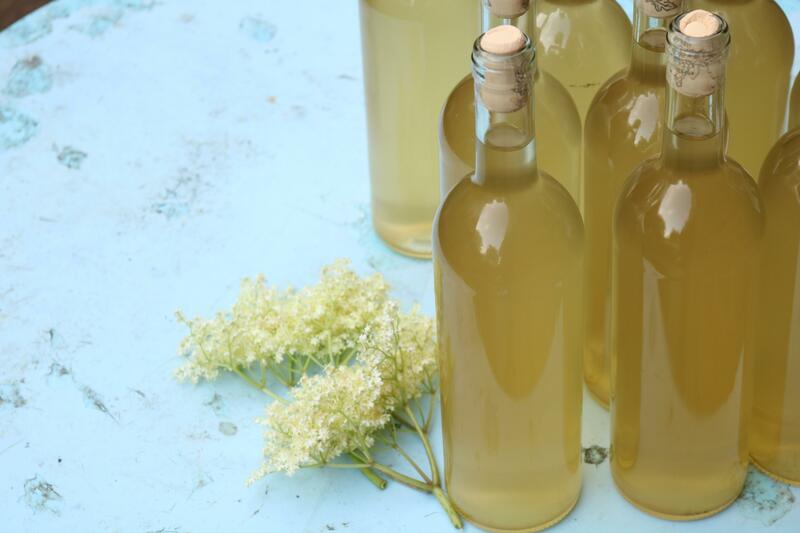 It’s no secret that I love Elderflower, it’s my all time favourite foraged treat and one of the things I love making the most is Elderflower champagne. For the past 4 years I’ve been making the same batch of champagne and it’s such a simple recipe to follow. 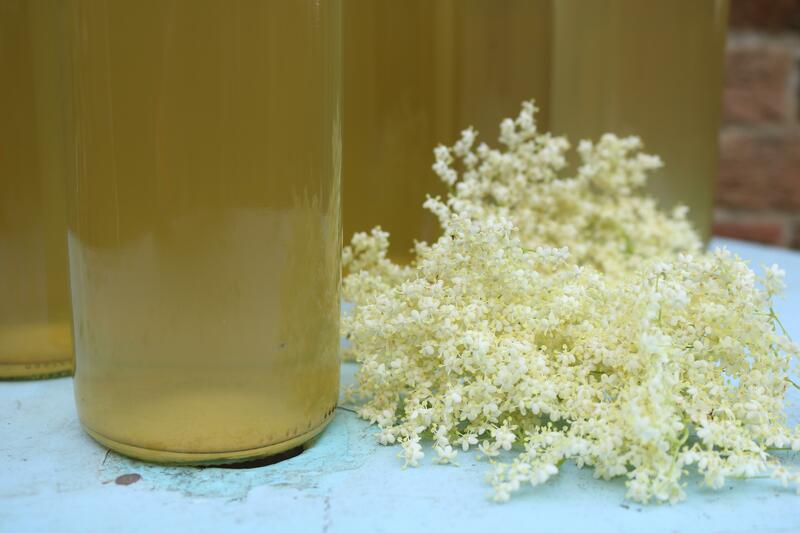 The result is a very sweet, fragrant drink perfect for sipping on during those hot Summer days. For me it is the taste of Summer and I wouldn’t be without it every year! It’s become a tradition now and I’m still learning along the way, the newest addition this year is to try using plastic bottles which I’ll be reusing every single year from now on. Because the champagne is fizzy you need to be careful of the gas trapped inside, I lost some bottles last year where the corks popped off and I’ll be experimenting this year by letting some of the gas escape from the plastic bottles, once they inflate a little I can simply unscrew the lid slightly and let that gas escape. 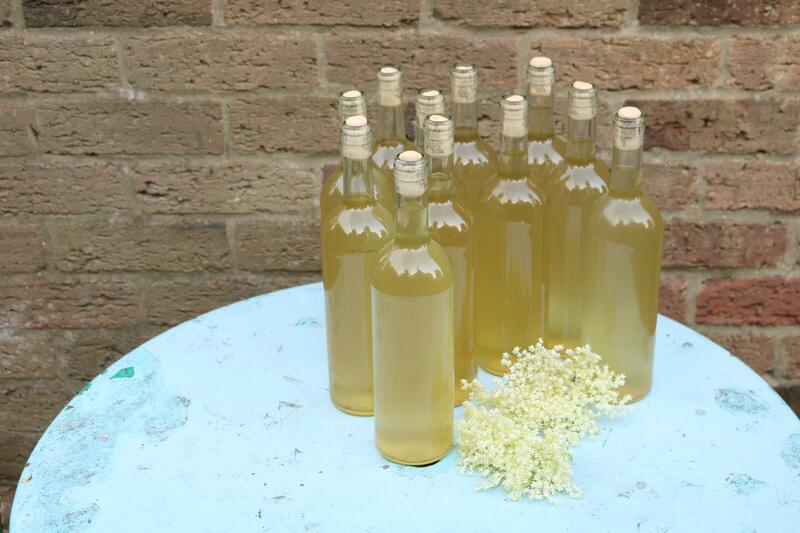 This year I harvested a bumper crop of elderflower so I decided to triple the recipe and in the end made just under 25 litres. This should keep me going for a long time yet and I just can’t wait to try it, I’m thinking picnics and lazy evenings on the allotment! Anyway a few of you asked me for the recipe I use so here it is… plus a few tips I’ve learnt along the way. Enjoy! Treat yourself to some good quality corks! The first time I ever made champagne I purchased cheap old corks which crumbled and fell into the bottles every time I tried to remove them using a cork screw. If you are making it in bulk buy two large fermenting bins. One to brew the champagne in and then strain into the other when ready to bottle. I’ve always used glass bottles with corks but be warned to lose a few to the fizz! Last year 6 corks popped out so I’ve been using cages on top of the bottles to keep the cork in and so far no breakages! 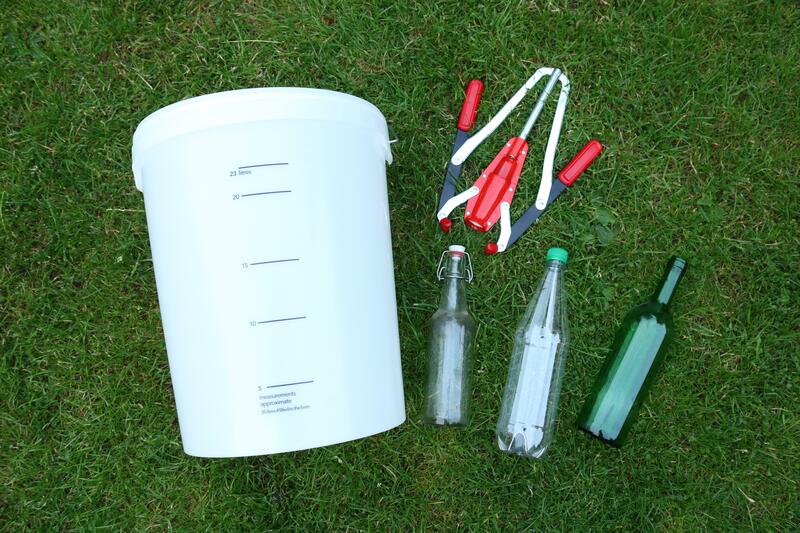 Alternatively you can use plastic bottles and when the bottles inflate a little you can let some of the gas escape by opening the lid slightly. Something I’m excitedly trying this year! Invest in good bottles and re use every year. Make sure you sterilise them too, I simply give them a good clean with a bottle brush and pour a little hot water inside so it steams up. 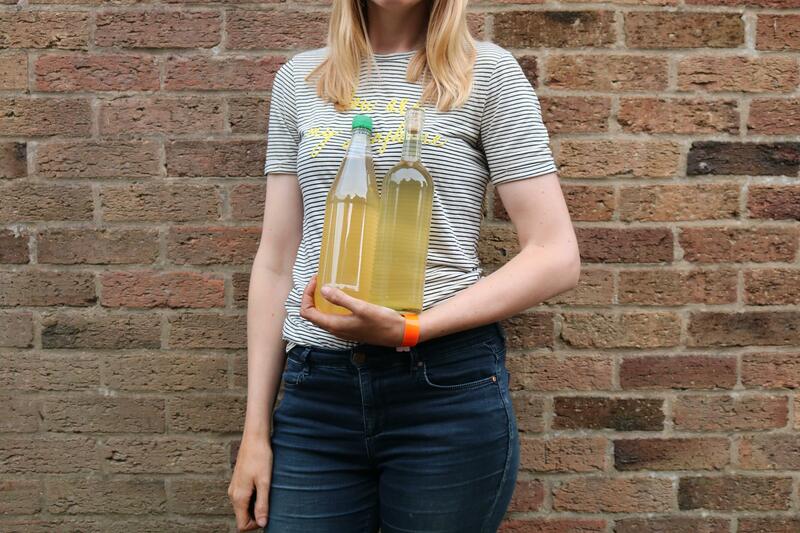 If citric acid is needed (which isn’t for this recipe) buy in bulk, every year the shops sell out and I’m frantically trying to order it online for a speedy delivery! Last but not least have fun! Put the sugar into a large sterilised fermenting bin and boil 8 litres of water. Pour over the sugar and stir until it dissolves then leave to cool. 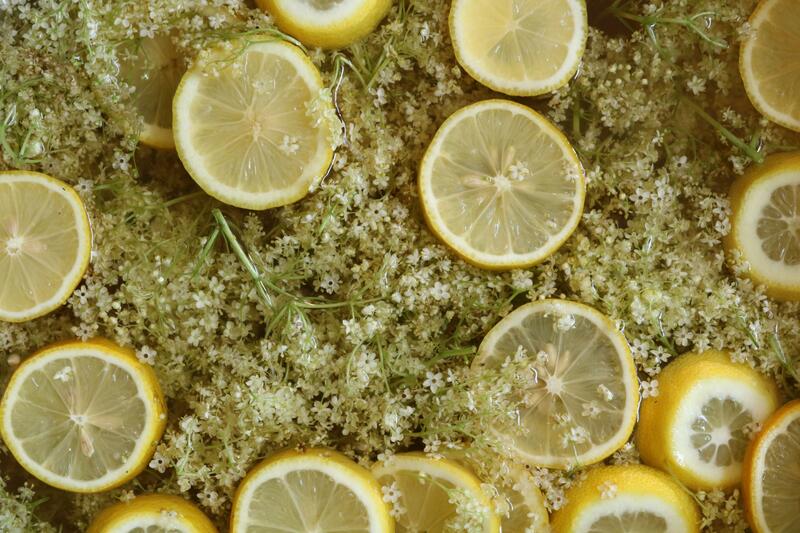 Shake the elderflower heads to remove any insects and add to the sugar solution with the juice of 2 lemons. Cut the other 2 lemons into slices and add to the fermenting bin along with the white wine vinegar. Stir and cover with a clean cloth, leave for 1 day. Strain through a muslin cloth, squeezing the flowers as you do to release more flavour. Using a funnel transfer the mixture into bottles leaving at least 2cm of space at the neck of each bottle. Seal and store in a cool, dark place. They are ready to drink in 10-14 days but will get better and more potent with age!